WANTED: a director for a blog conference. Much of the work for the conference is done, but someone needs to be the point of contact and coordinate all the arrangements between the different ‘subcontractors’ who care for the sponsors, website, etc. in order for the conference to fly well. Great speakers have already committed to coming — like Ben Stone. Blogging has been great for me — I can stay in touch with people, I’ve been able to meet many new people, and with social media, I’ve been able tohelp save a barn, assist home school families, and learn new ways to be frugal through the Frugal Tuesday Tip. I highly recommend attending a blog conference — maybe a ticket would make a nice Christmas gift? Teach me again! What frugal things have you done this past week? 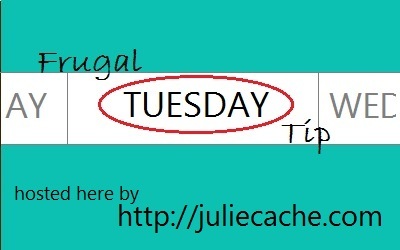 This entry was posted in blogging, frugal family and tagged frugal tuesday tip. Bookmark the permalink.